December passed in a blur and I am sure I am not the only one feeling like that. I’ve taken the first few days of January as an opportunity to reflect on what is next for T&T and this blog. 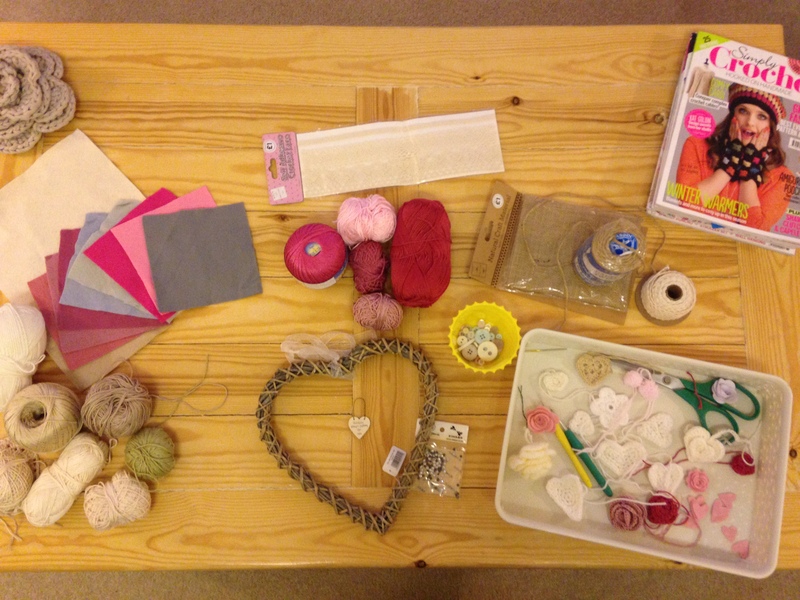 Truth be told, I love crafting but I sometimes find writing about it a drag. Other times, I have far too much to say! So…this year, I am planning to mix it up a bit. I have even written a blogging schedule! I hope you like the new look. I’ve included a few pics of the T&T crew because, really, the children were what Christmas was all about. I hope you laughed at our attempt at a gingerbread house! It completely fell apart. Oops!! Today has been my first day back at the T&T desk (well, actually, the sofa as my desk is covered in Christmas decorations that still need boxing!) and it feels good. I have been furiously planning and preparing. I’ve been thinking about this a lot recently, so thought I would take a break from craft (almost). Just for tonight. 1. You will use baby wipes for everything. I mean everything! 2. Your greatest allies on this crazy journey are other mums. They are also capable of being your harshest critics. Hang on to the good ones, you’re going to need eachother. 3. You are going to look back at the early weeks one day and laugh/cringe at some of the crazy things you did! For me, it’s the video of us bathing Little Mr Toad for the first time – baby in one hand instruction manual in the other! I’m weeping with laughter inside just thinking about it! 4. It’s a huge secret, but babies don’t spend the nine months in the womb reading baby books. They can’t read and, if they could, they probably wouldn’t be reading the book you bought. That’s ok because they are as individual as you and me. 5. Breast feeding is (for all but the lucky few) hard. Really, really hard. The Mum feeding in the cafe may look like she has it sorted but, in all likelihood, she has spent hours and hours behind closed doors struggling to make it work and even now she’s afraid that she’s getting it wrong. She almost definitely isn’t. 6. You are going to become completely blase about wee, poo and vomit and will probably find yourself leaving the house wearing at least one, if not all three. More than once. 7. This little gummy bundle is going to teach you things you had no idea you needed to know. The greatest thing you will learn is how completely and utterly unconditional love can be. 8. 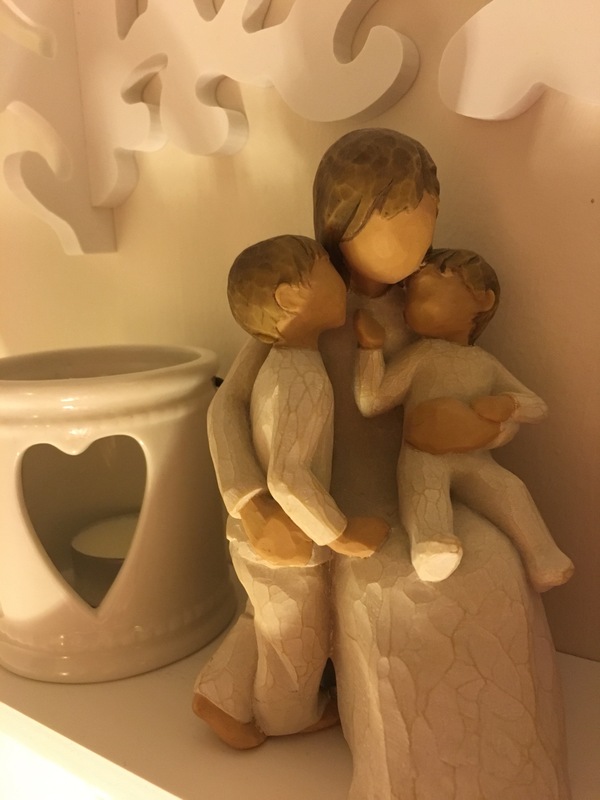 A “mother’s instinct” is actually a thing. 9. “This too shall pass” – you’ll hear that a lot and that’s because IT WILL. Soon the baby days will be gone forever and you are going to miss them. 10. The early days are a crash course in extreme exhaustion. Tiredness like you have never, ever experienced before but it is so, so worth it. Few, if any, babies sleep through from the off, they aren’t made that way and that’s ok.
11. The answer to the question “how do you do it?” is L.O.V.E. In other words – I love this tiny human more than words can explain and would give my life for him*, he needs me. 12. Perfect parenting is a figment of imagination and exists only in the dreams of those who are yet to experience it for themselves. You are going to get it wrong sometimes, don’t be hard on yourself when you do. Tomorrow is a fresh new day. 13. Those leaky eye pregnancy hormones have done something crazy to your tear ducts because they will continue to leak at the drop of the hat. I’m willing to go out on a limb here and say that that isn’t going to change for the rest of your life. 14. No matter how exhausted you have been all day, you’ll wake up and develop a need to do anything and everything you can think of the moment the gummy wrinkly bundle is asleep. You’ll probably get fed up of hearing well meaning people telling you to “sleep when the baby sleeps”. One day you will realise that you should have listened to them and begin sharing that advice with all and sundry. You’ll actually do it (when you can) when baby number two comes along (and, if you can’t, wish you could jump back in time to the newborn days with baby #1 and go tell yourself to, for goodness sake, sleep when the baby sleeps!). 15. This is going to change you. Forever. For the better. It’s going to add new colours and shades to your life and that old life is going to feel monochrome by comparison – even tho leaving the house, with your partner alone or after dark is now almost completely a thing of the past. 16. You can do it and, if you are struggling, there is no shame in admitting it and reaching out for help. We all struggle sometimes – see ‘thing’ 12 above! 17. All you really need is nappies, clothes, a sleeping place and a supply of milk and love. The rest will take care of itself. 18.There are going to be good days and bad days, there are going to be days you feel like a total failure and there are going to be days that create memories that you will hold on to for the rest of your life. 19. It is possible to make peace with a ‘Mum tum’ and stretch marks. 20. When all’s said and done, you are about to start the most incredible journey of your life. Buckle up and enjoy the ride! P.S. 21. You’ll become so evangelical about it that a list of ’10 things that nobody tells a Mum to be, but probably should’ turns into a list of 20 (or 21) things quite by accident. I’d love to hear what you would add to the list. 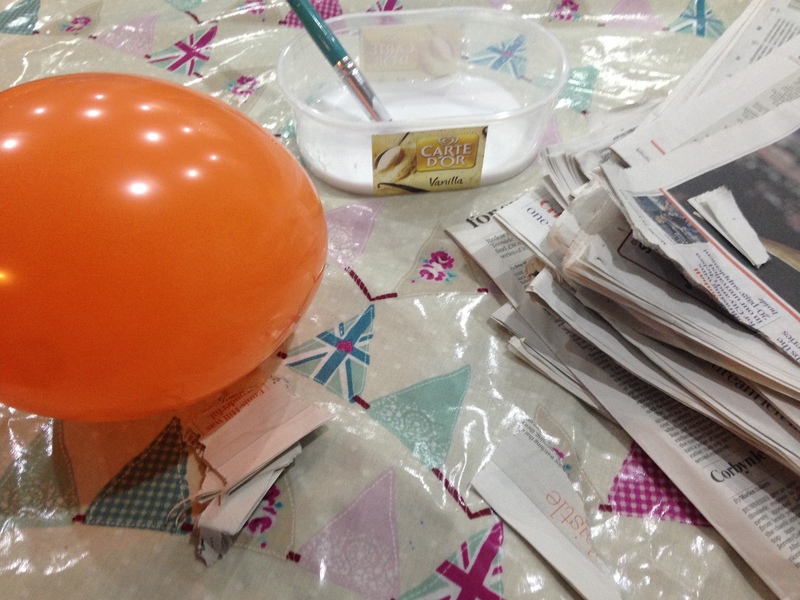 Party week is crafty week! 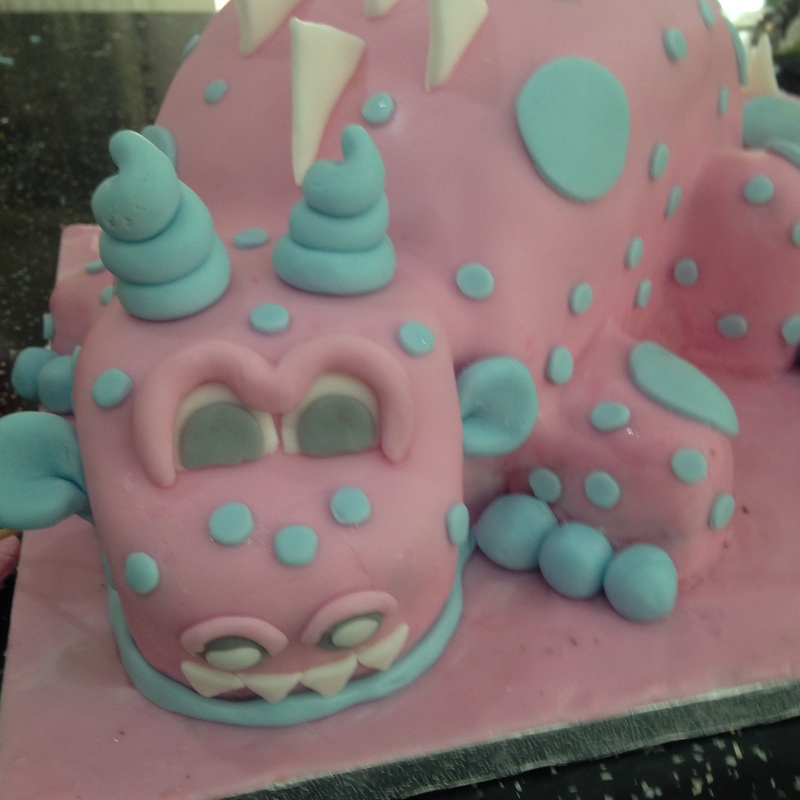 Last week was birthday week here at T&T HQ and, boy, was it busy! So much so that blogging and my usual crafting went totally out of the window but my big little man is just so very worth it! 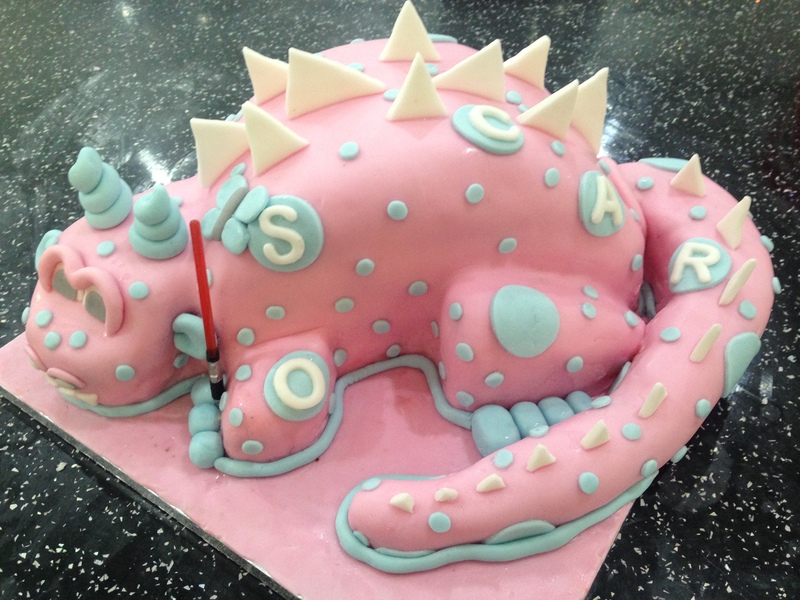 A few months ago, he requested a dinosaur cake. I found an image to use for inspiration that I could work with and felt fairly happy that I could achieve it. Then I started plotting for a dinosaur themed party. 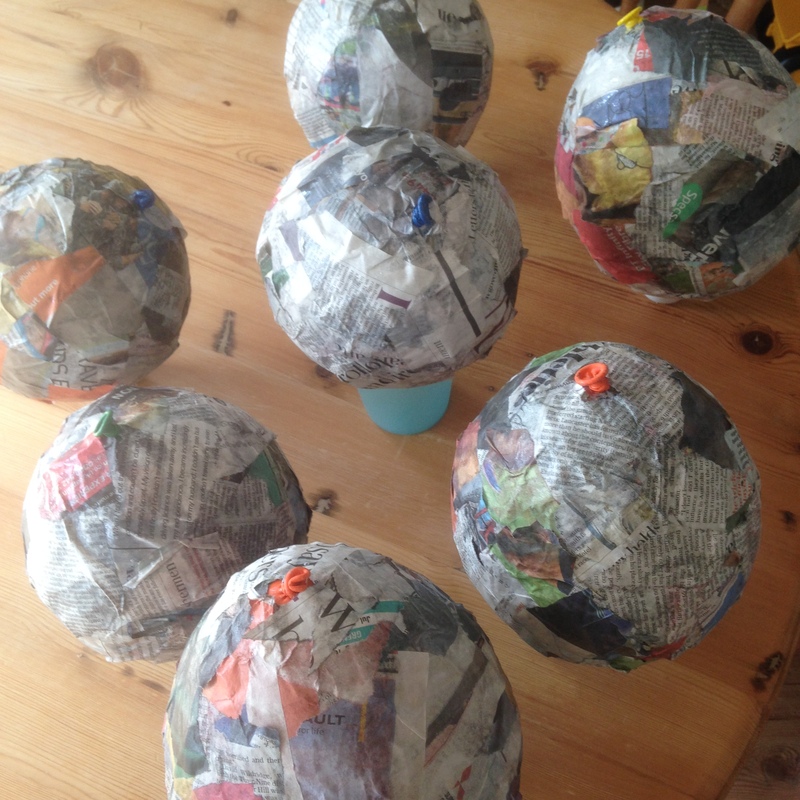 We made papier mache dino eggs – which T&T both helped with – you can see the finished eggs on the birthday party table below. 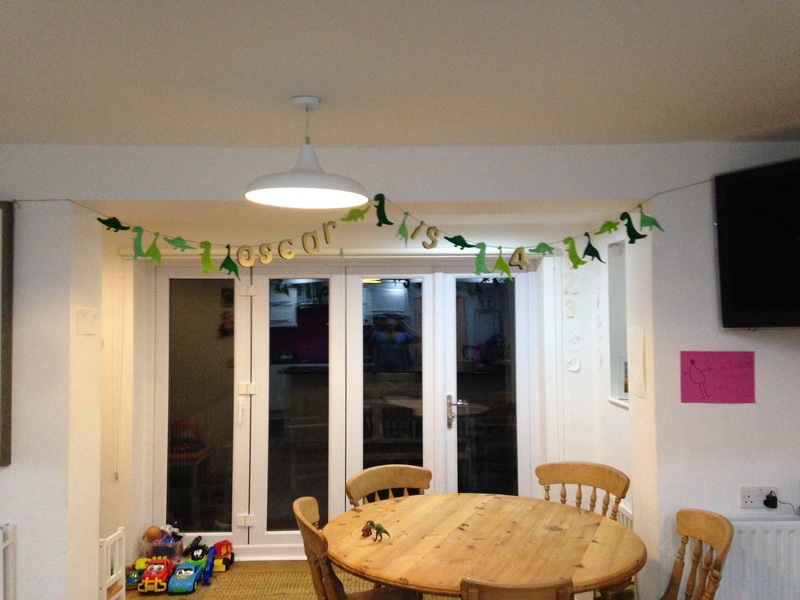 Mr T&T helped me to making dino bunting. I drew the templates and did the cutting out – my craft scissors are mine and only mine! And I also whipped up some dino foot prints. And, Ta da!!! 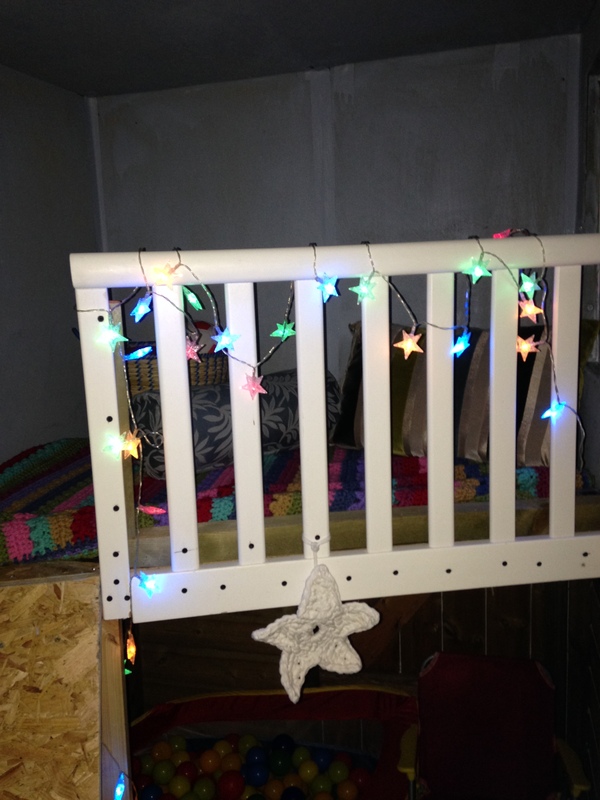 We decorated the boy shed. 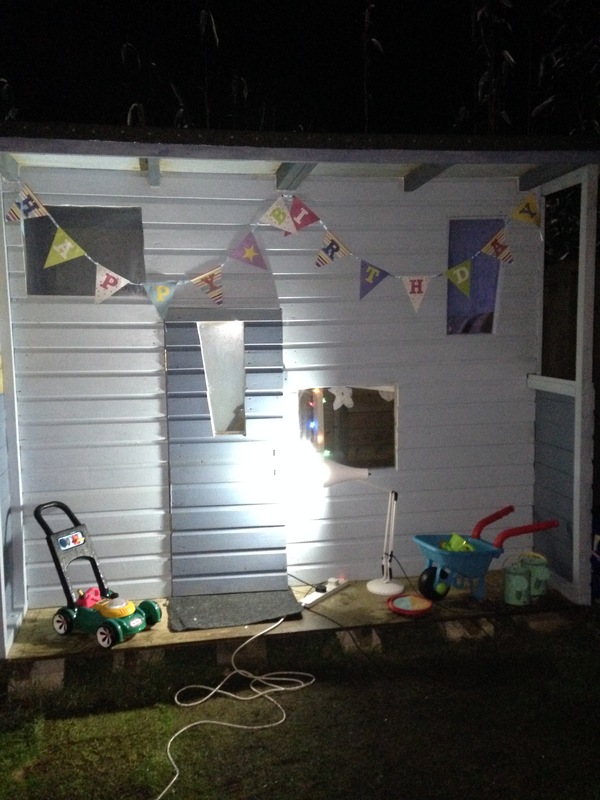 Sadly We ran out of time to get it properly finished but it is functional and, for two small boys, that’s all that matters. 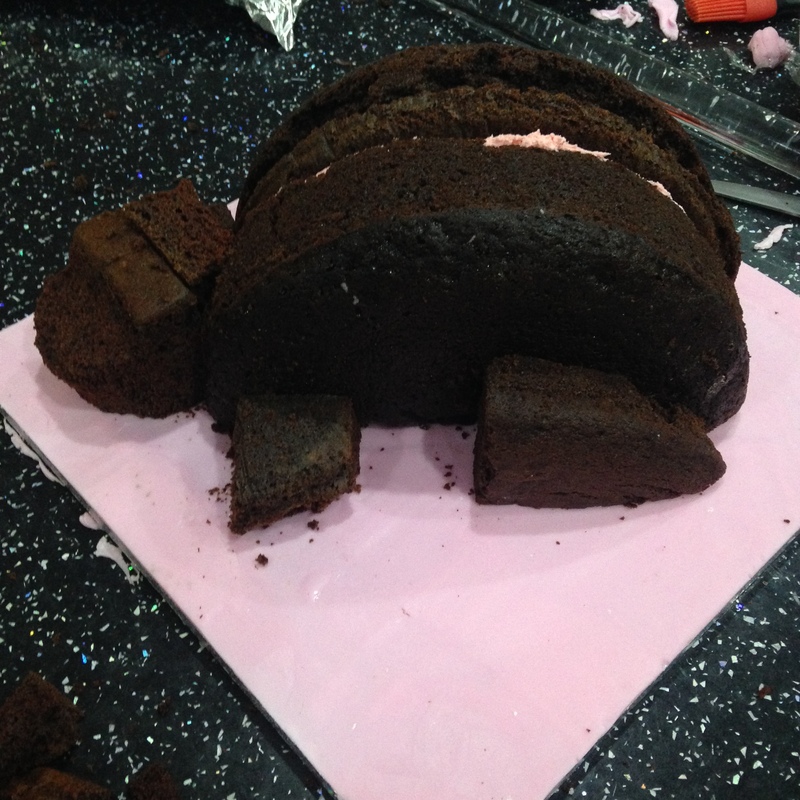 …and then came the cakes. Mr Toad had a slight change of heart at the beginning of the week and decided to add a butterfly into the mix, followed by Star Wars!!! 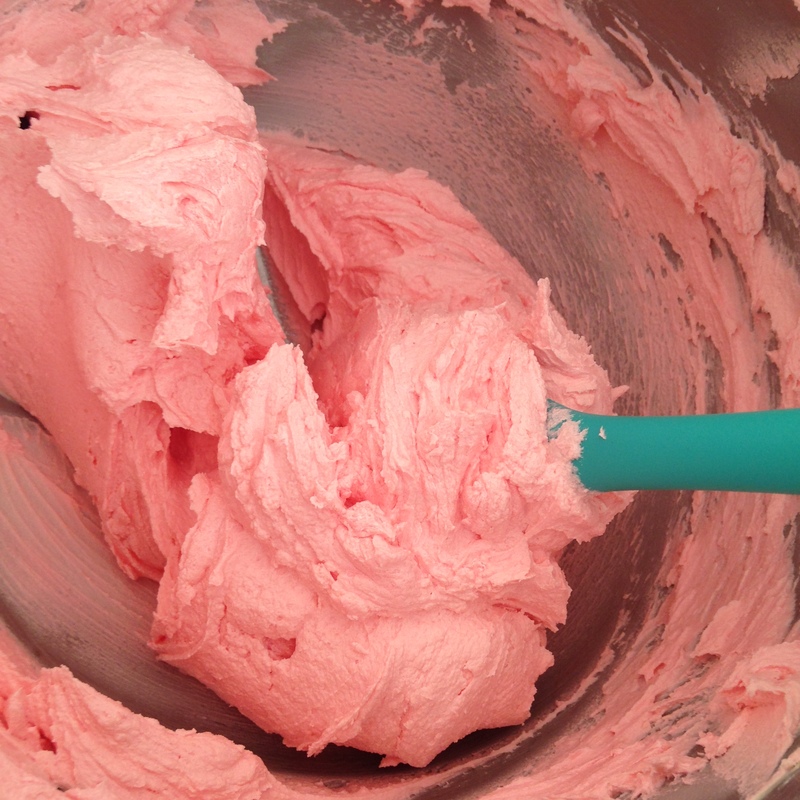 Oh, and the cake needed to be pink. I had been planning on blue or green. Pink is Toad’s favourite colour, so I don’t suppose I should have really been all that surprised. But I was. 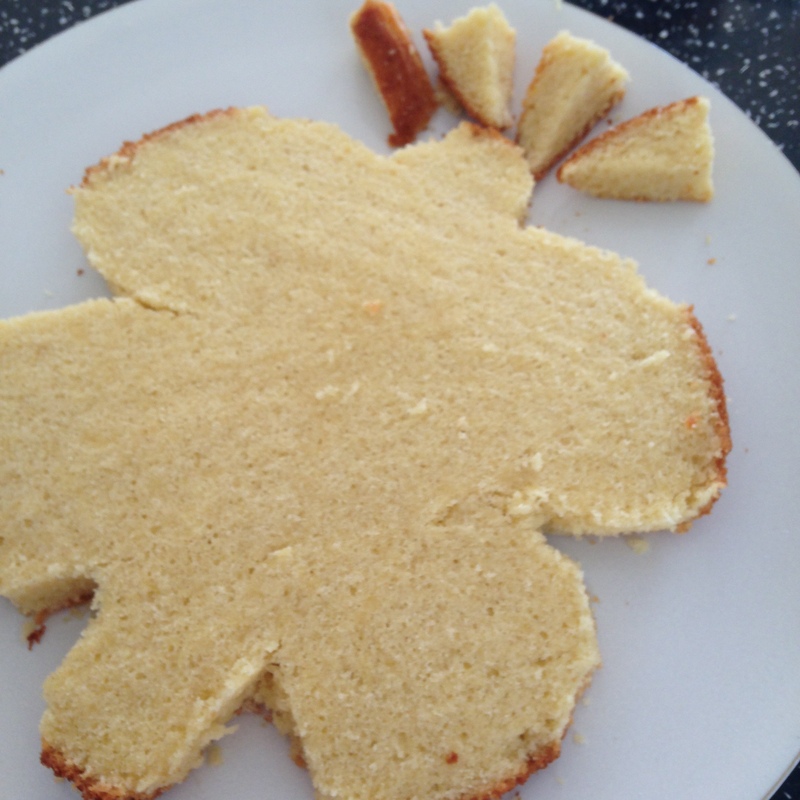 Having two boys, I hadn’t ever imagined creating either butterfly cakes or pink ones but, last week I did both. 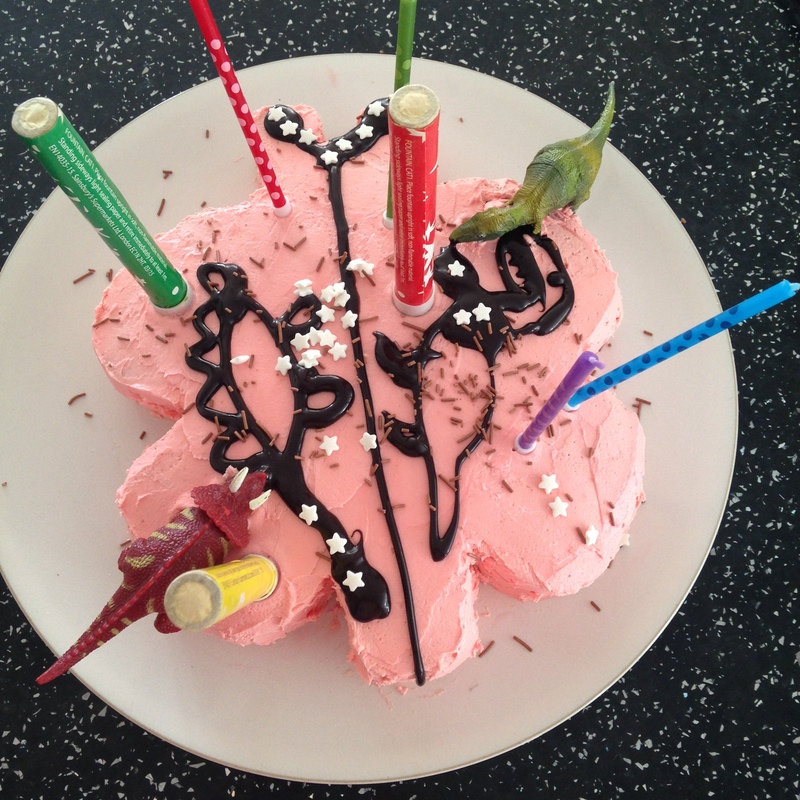 We crafted (in the loosest sense of the word) a butterfly cake together for Toad’s actually birthday. 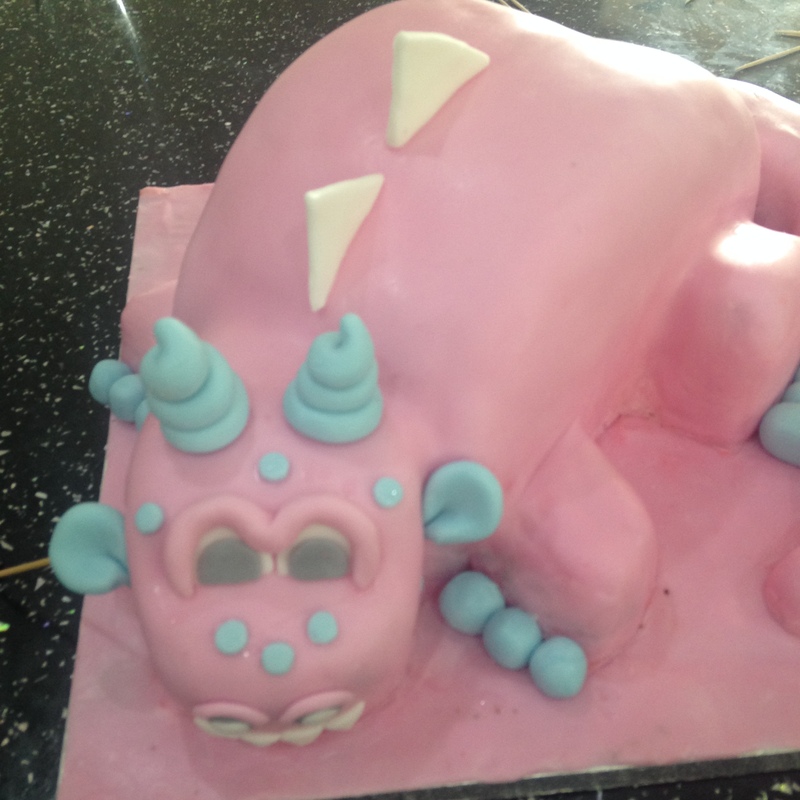 Just to be clear, this cake was a butterfly, dinosaur cake whilst the cake made for his party was a dinosaur, butterfly, Star Wars cake. Confused? Well, hopefully, the photographs below will explain things a little. 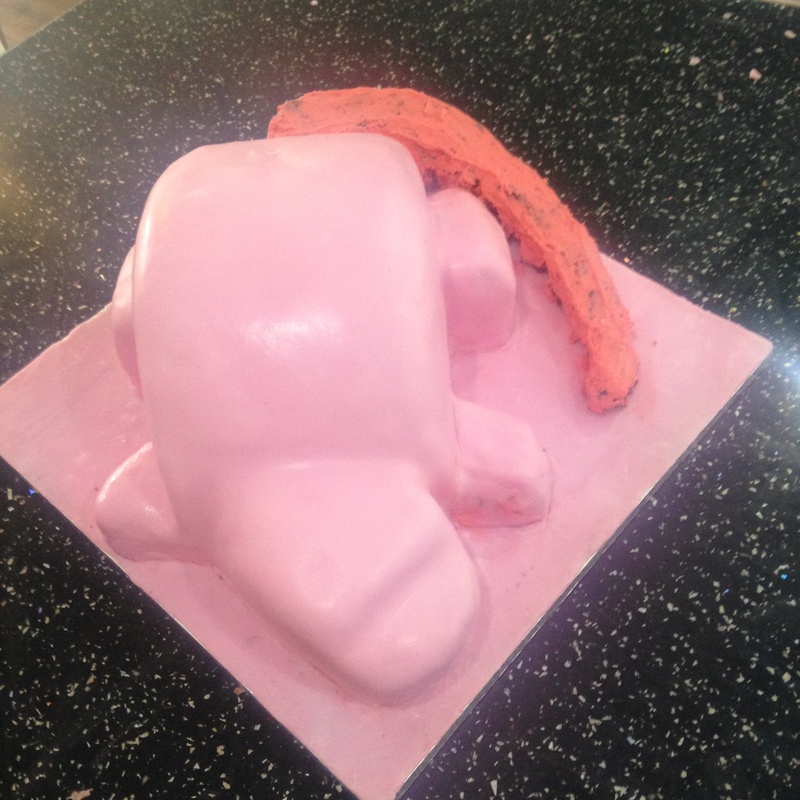 We like to think of it as rustic and Toad had such wonderful fun helping to decorate it and deciding that the dinosaurs should be eating the chocolate sauce. 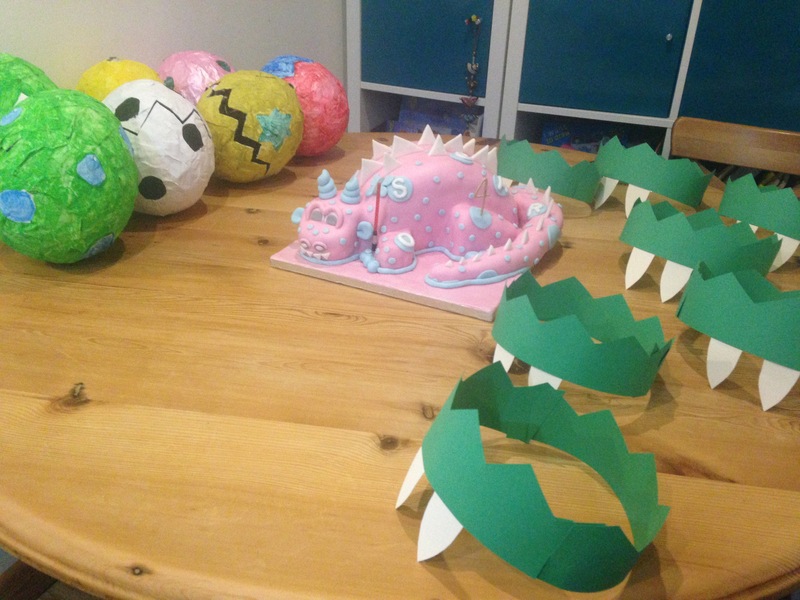 Toad’s party was, sadly, small but he loved all of the dino touches and the eggs went down a storm. This morning he polished off the dino’s horns and teeth and, tonight, Tiny snuck a few toes into his little tummy. 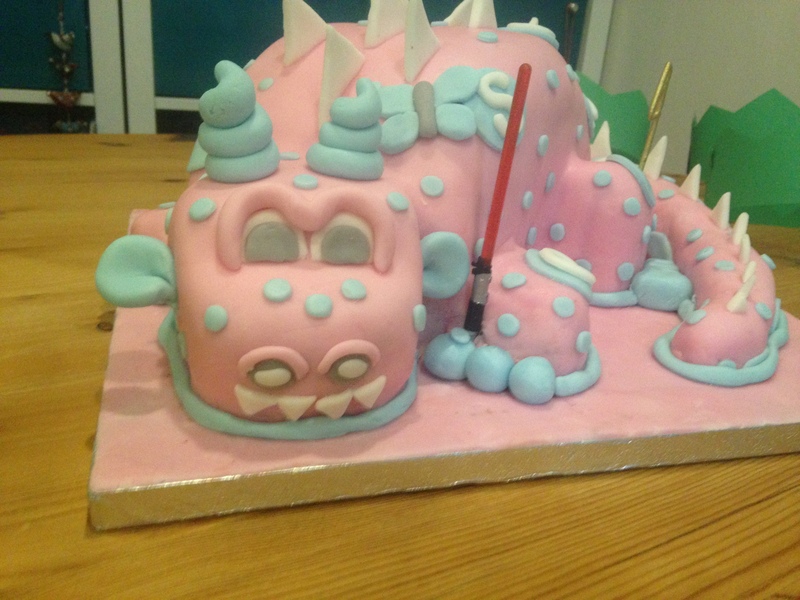 When T&T are involved, deconstructing pink with blue spots dinosaur, butterfly Star Wars cake turns out to be far more enjoyable than I had imagined! p.s. This week is exciting too…more of that tomorrow! At T&T HQ time seems to disappear into a vacuum. I’m sure that I only published my last blog 5 minutes ago, yet just over two weeks have passed. It’s been busy, T&T have been fun (and tiring!) and we seem to be setting ourselves up for winter’s hibernation. This last weekend, we’ve all made the most of the good weather and spent both days out in the garden getting muddy. We’ve been in our home for just over a year and just hadn’t quite taken ownership of the garden…until Saturday afternoon. It’s a bit of a back to the drawing board plan since what we inherited was a little lacking in the aesthetic department and, frankly, neither of us know a whole lot about how not to kill plants, but we’re about to learn! The creativity has, of course, not been limited to the garden, I’ve added to my yarn stash with lots of dusky pinks, neutrals and Christmassy colours with the result that I am currently caretaker of a constantly growing collection of works in progress. I’ve promised myself that I have until the end of the week to remedy that situation. 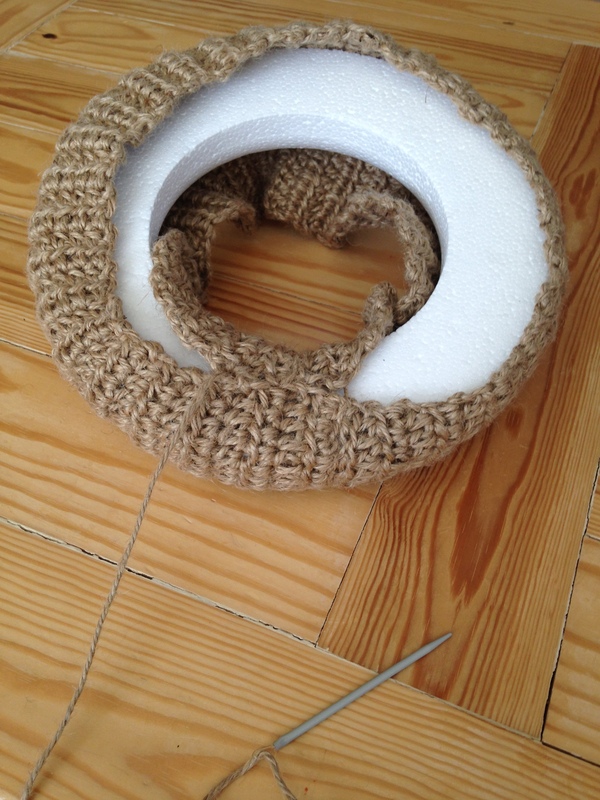 This is the beginning of a rug using Hooked Zpagetti yarn. 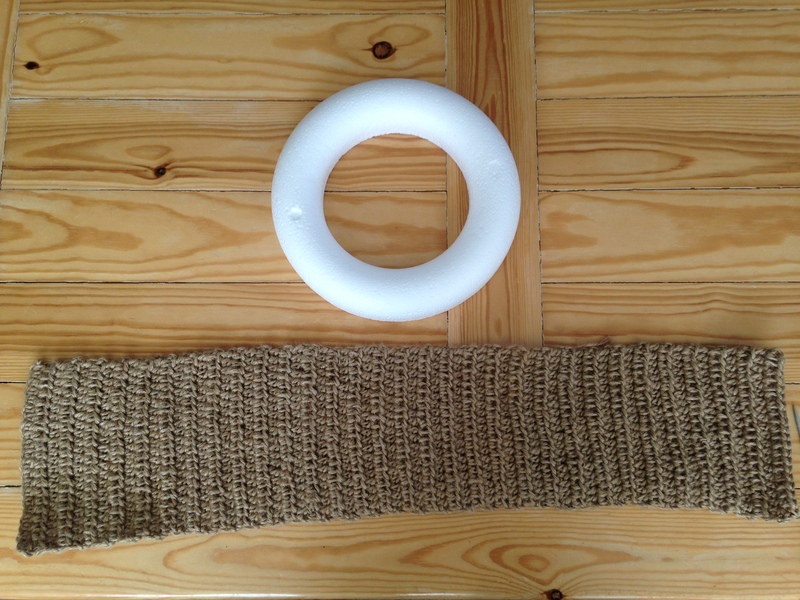 This is t-shirt yarn – a waste product from the textile industry. 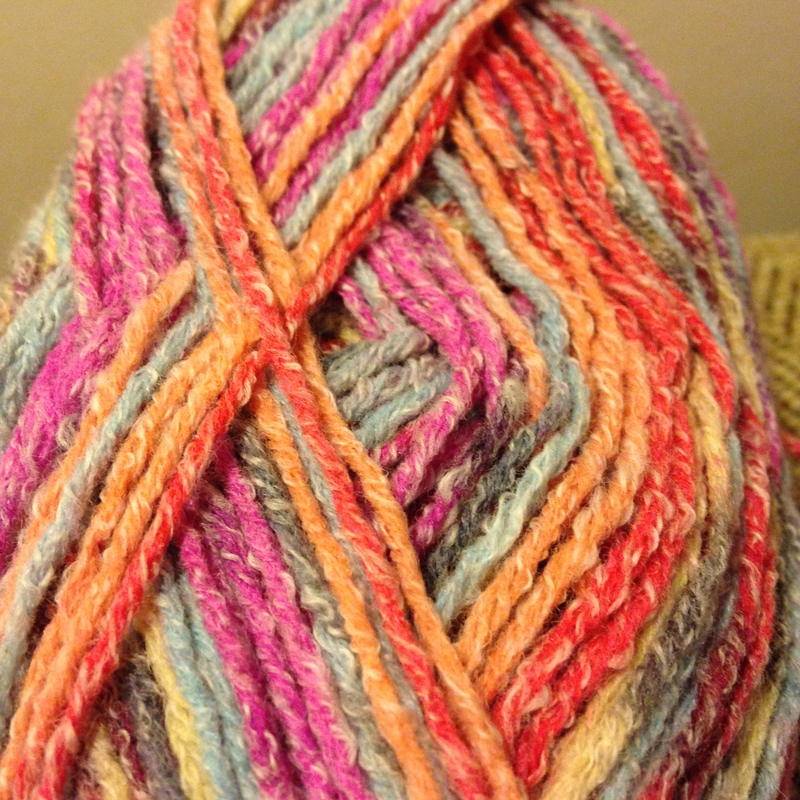 Using such a large hook and this yarn is hard on the hands so this one is going to be a pick up and put down project. Since it is for us, there is no particular hurry. I have managed to finish the odd project in the last couple of weeks. This is my finished Attic24 ripple ‘blanket’. Truthfully, I am not a blanket girl, I just find them far too repetitive. 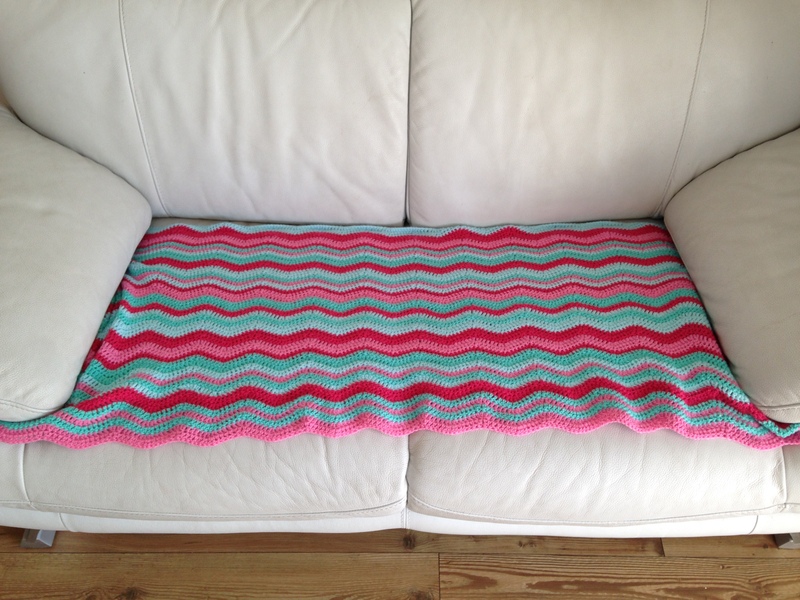 I love the finished look of this ripple blanket but I started it in June 2014 and finished about ten days ago and it’s considerably shorter than it is wide – just the depth of the sofa seat. I couldn’t even begin to estimate how many times I have picked it up and put it down again. 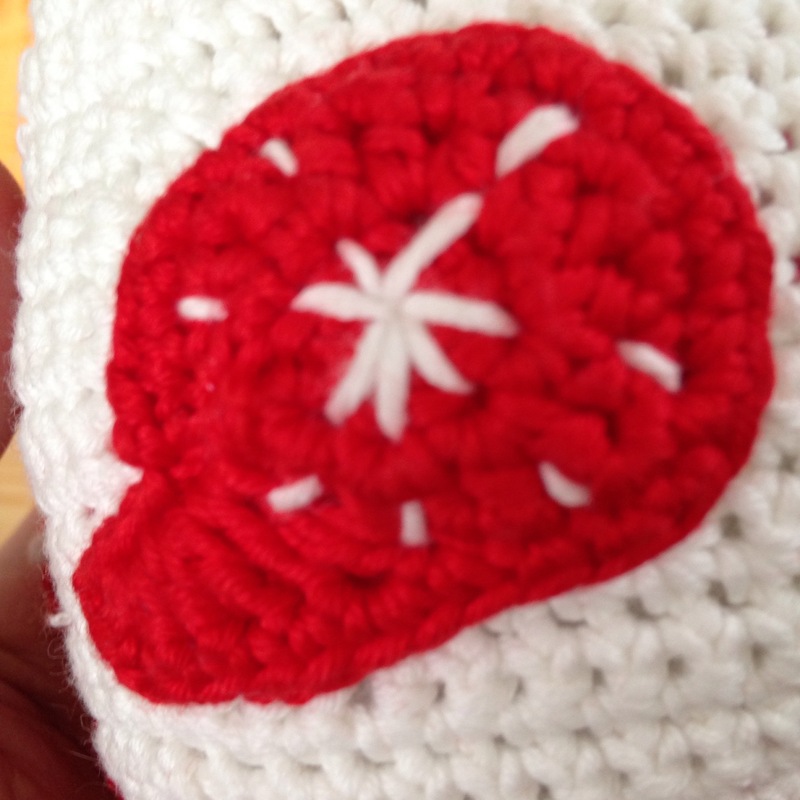 So, for now, I am going to retire from hooking blankets and concentrate on my smaller (and quicker!) projects. 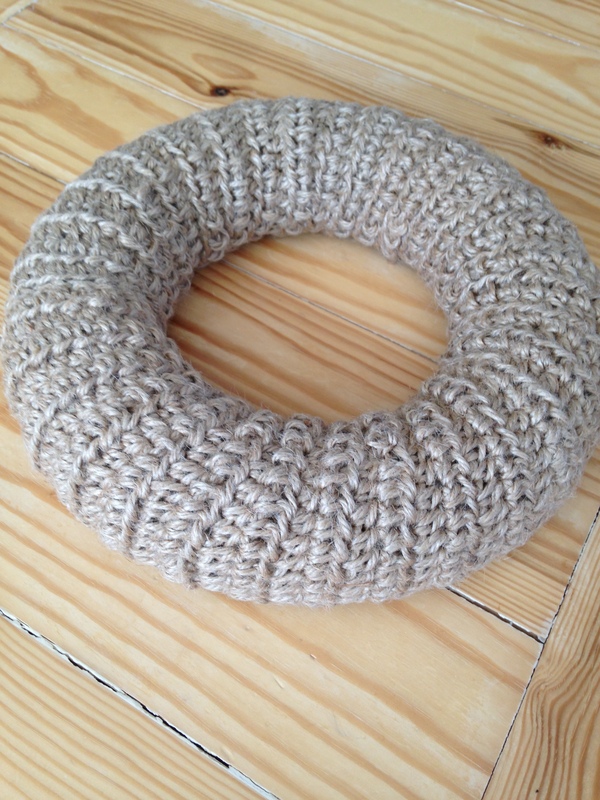 I used a 25cm half ring for this project so it will be the right size for hanging on a front door. Next job (on this project at least) is to finally decide on embellishments. 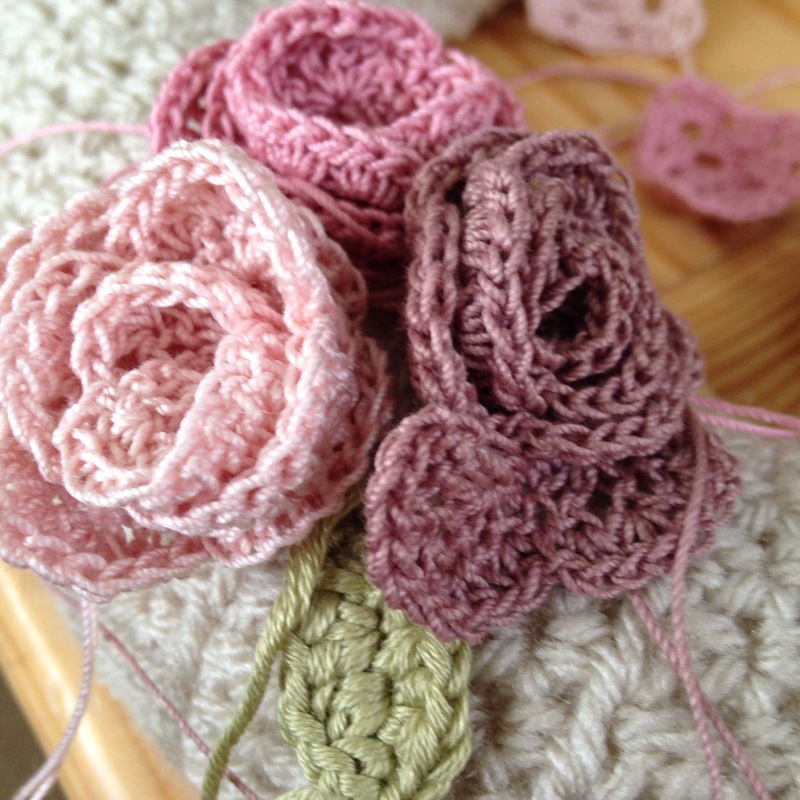 I’m on a little journey in cotton and these flowers are part of my experiment in crochet cotton in particular. 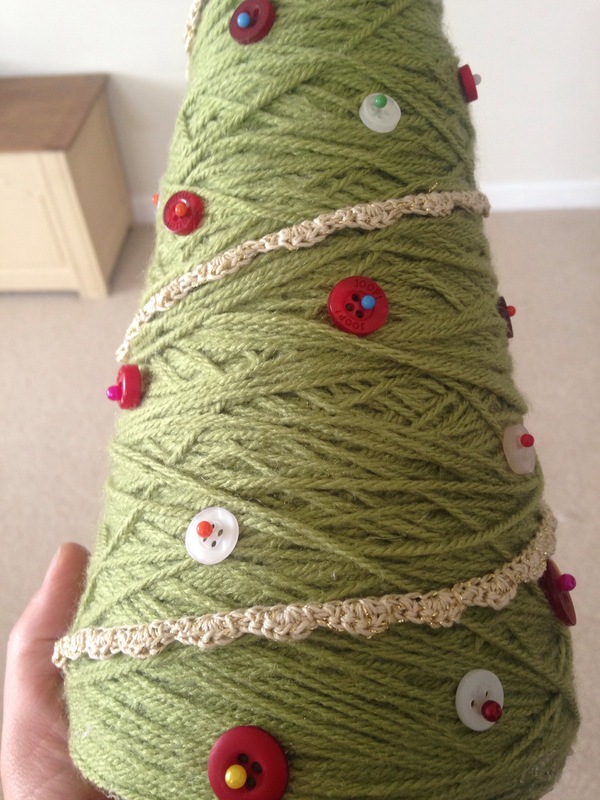 The cone tree is very much a work in progress (another one!) and the first of many, many things I have in mind for Christmas 2015. Watch this space! …does not make me a happy girl! I just closed the web page that I had been typing on for half an hour. That hurt! I have been suffering from writer’s block. This is both a bit of a pain and a bit of a pleasure – don’t I need to be a writer to suffer from such an affliction? I’ve been thinking about what I would like my relationship with blogging to be, this is something that I am doing for the joy and I don’t want it ever to become a toil or an obligation. So, if i have nothing to say, silence is the best policy in my book. On Sunday evening, I was busy in silence. Sitting on the sofa feeling totally exhausted when I got to thinking. Half an hour or so into thinking, a challenge set by my Dad on Tuesday dangled along. He’s in to growing orchids. In a temperature controlled indoor greenhouse kind of way and he beautifully described the colour variation on a paphiopedilum as he wondered out loud if I might be able to crochet one. I had searched for a pattern and failed to find one and rather forgotten all about it. But, there it was that evening poking at my subconscious and as I thought, I started to plan and planning just blossomed into creating. Funny what can happen during Call the Midwife! Accepted it is more abstract that realistic, but this was my first attempt at 3D without a pattern and I think it worked out ok. 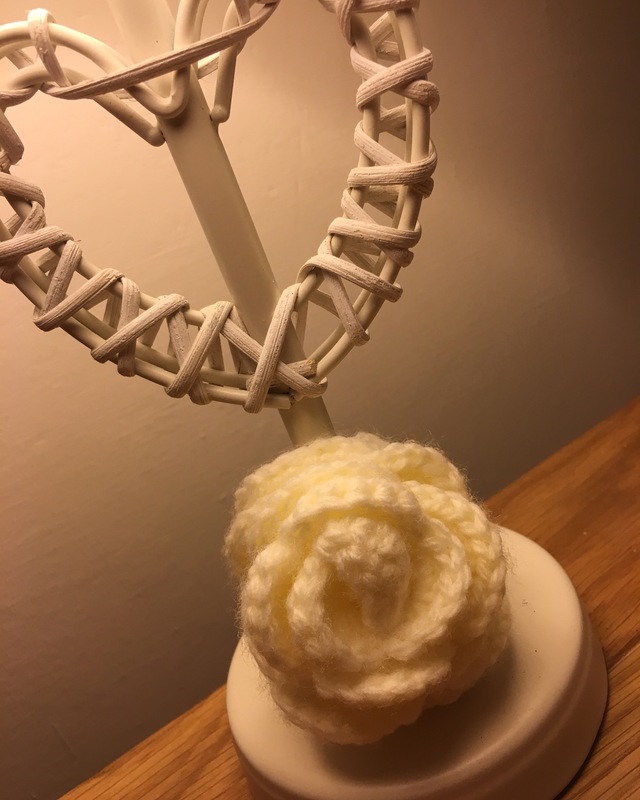 I have already shared my little Orchid on a Crochet Facebook group and a lady has asked me for the pattern. What a privilege! 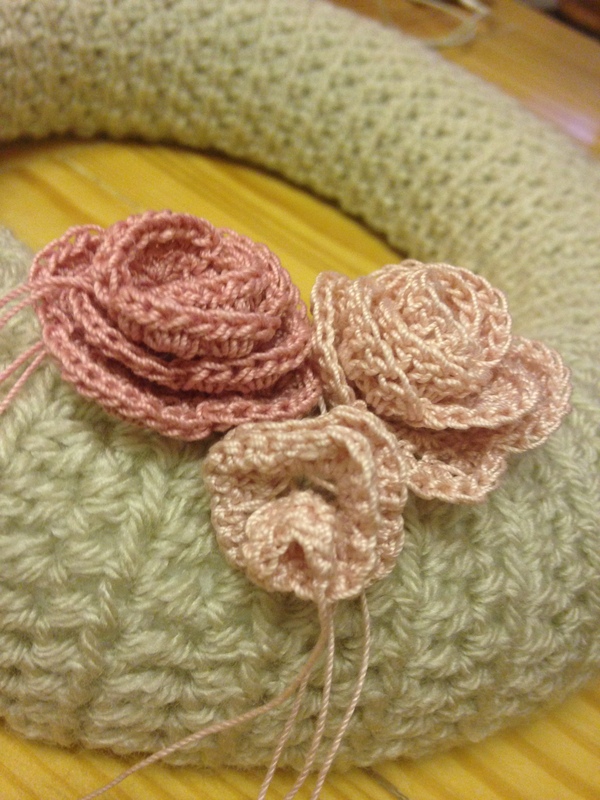 I am planning to refine the pattern and make another, but I have never written a pattern, ever! Thankfully, the lady wants to put an orchid or two in a bouquet for her friend’s wedding in a year’s time. So I’ve got time to get it right! I usually upload the photos for my blogs before I start writing but this week it I left that task until between this paragraph and the one above. 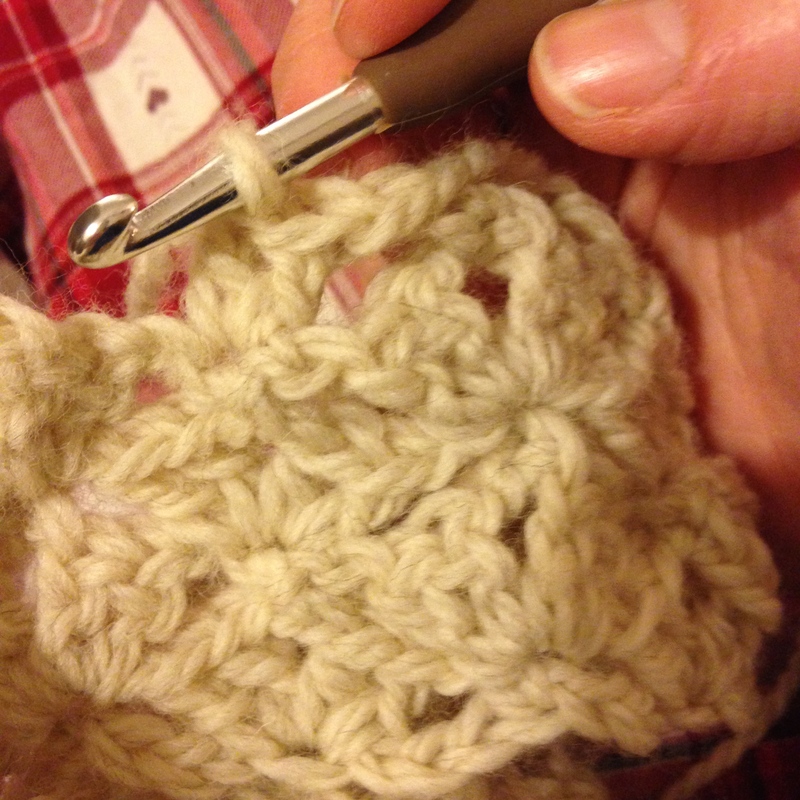 That process has rather helped to explain the reason for my writing block – there has been a whole lot of crochet. I have two under 4s, work three days a week and have had visitors over the weekend and still I seem to have churned out quite a few projects. 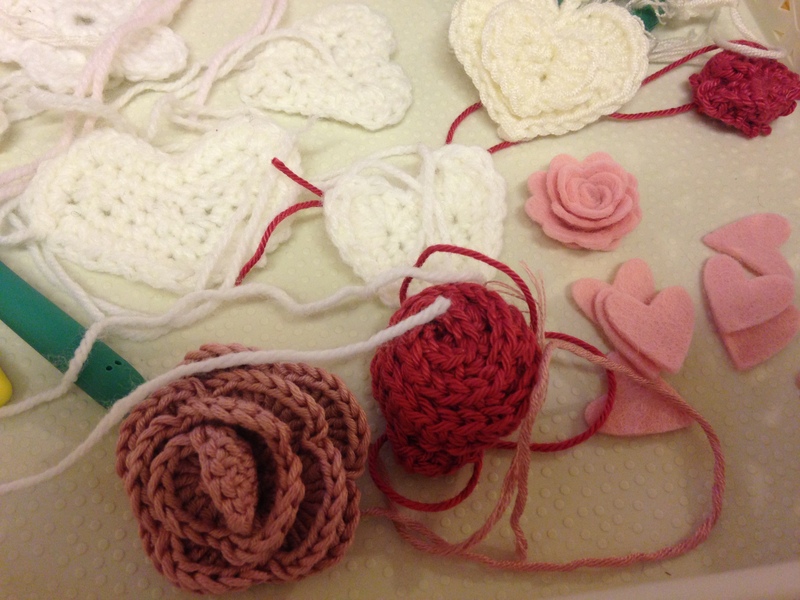 Having finished my Valentine’s wreath (which you can read about here) I found I needed a totally different project. It’s a throw for my lounge and it is in beautiful Peruvian Cascade ecological wool in vanilla you can find it here. This photo does it no justice. 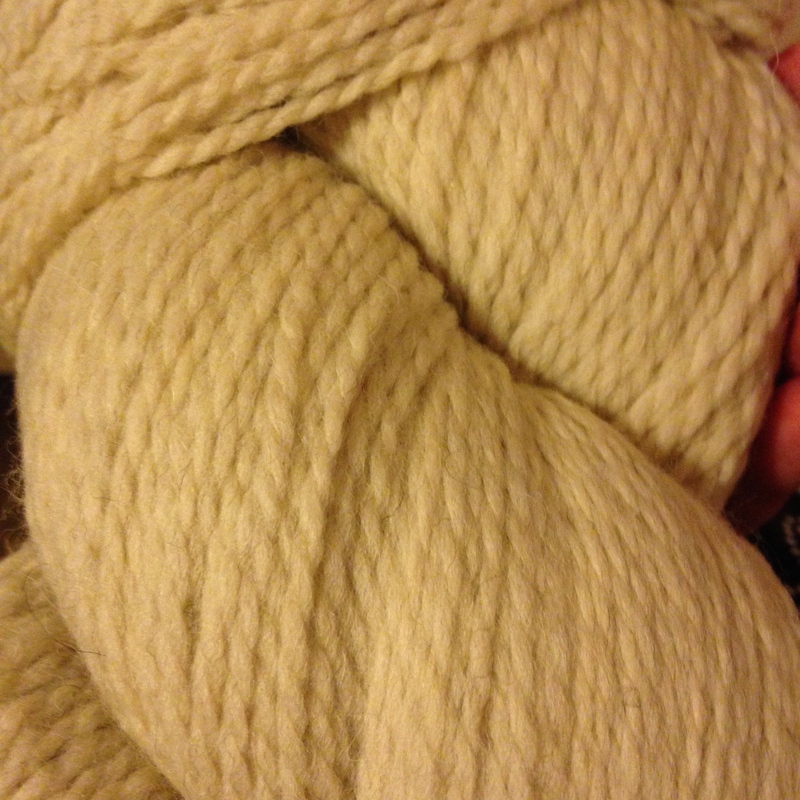 It is so wonderfully soft and, is going to make the most beautifully cuddly throw/blanket. 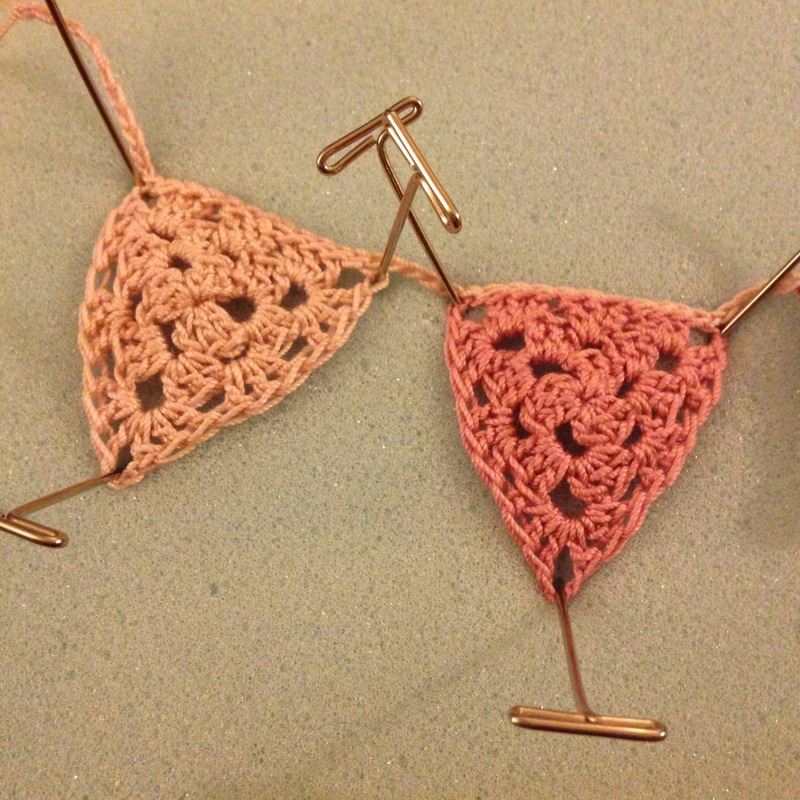 I think I should admit that I am not so good at repetitive crochet. I get bored. So, the blanket, a few rows in, is currently sitting in a drawer because something else inspired me. I will finish it, just not this week! At the point at which I took the above photo I was really beginning to think that I had seriously over-estimated my abilities. Covering the second half of the letter was a good bit of a challenge and I am sure that there is a better way than mine but I did, eventually, make it work. 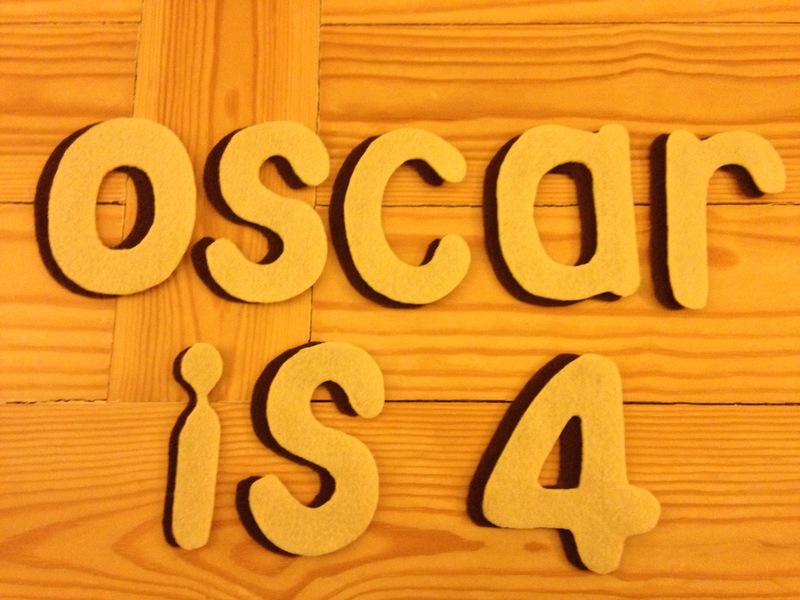 Have you guessed what the middle two letters are yet? I love it! I am definitely not sold on this type of yarn and will be sticking to single coloured balls in future (ooh, apart from the Eastery coloured self striping yarn that I bought at the same time) but I do love the overall effect on my little letters. I can’t wait to roll them out for Valentine’s weekend. G doesn’t do Valentine’s so I am not sure he’s going to know what’s hit him on Saturday morning. Tho, he has been warned! I really, really wished I didn’t have to give this cute little posy away but dispatched Toad and G off to the hospital with it on Saturday afternoon. And it was appreciated, which ultimately made giving it away painless (well, almost). This is a really quick make and lots of fun. 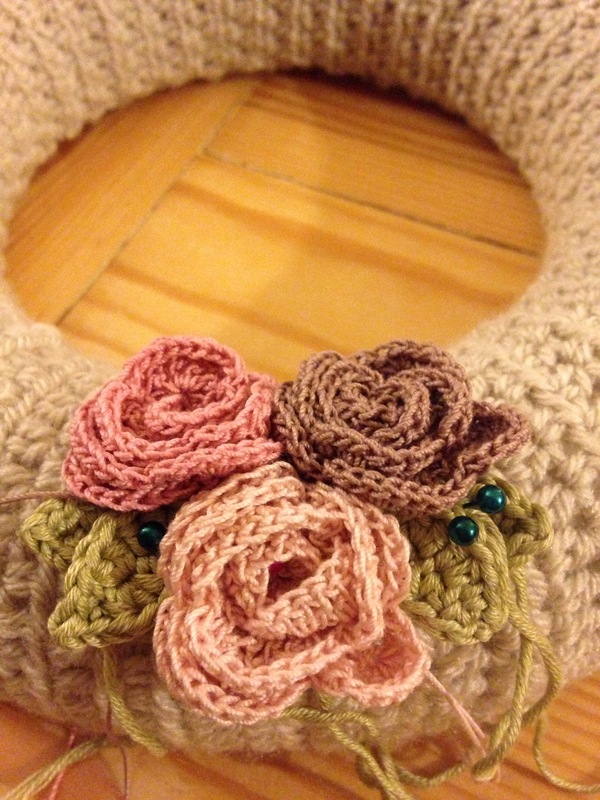 I think I might schedule an evening to make myself a posy very soon. The Toad came home from nursery with a Valentine’s present for me yesterday and I nearly exploded with pride. This may have been a guided project but, I am pretty sure, he’s picked up at least a little bit of my crafty genetic code after all!! This morning he was telling me how he had picked the colours. When asked if the pink beads were picked for him or me, his reply was “for all of us”. Oh my goodness, moments like that are just so precious. We’ve added a ribbon and found a window to hang it in. I think we’ll display it until well past 14th February. They just look like they need a bit of love don’t they? 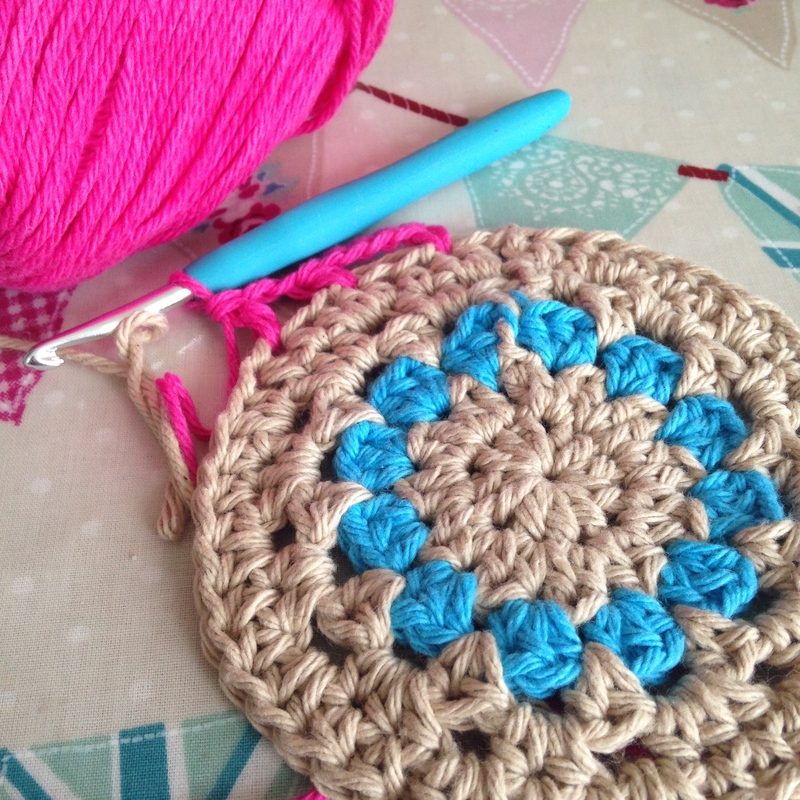 G may be right to worry that I might one day crochet a cover for the roof after all. Now that would be something to blog about! I am, I absolutely am. There is little that makes me happier than a freshly opened or created bloom or adding to my extensive collection of hearts. Such is my love of flowers that even Toad knows that “Mummy likes flowers”. He’s three and, if he and G ever go to the supermarket together, Toad insists that they come home with a bunch of flowers for me. He always picks the flowers and, once, I was even lucky enough to receive two bunches! The joy on his face as he rushes towards me with the words “Mummy we got you flowers” could make even a half eaten daisy seem like that very beautiful thing that I had always wanted. They sit on a window ledge in my hall and they bring sunshine in on even the dreariest of days. Even better, they don’t need watering (I’m not too good at remembering that) and will never wilt. 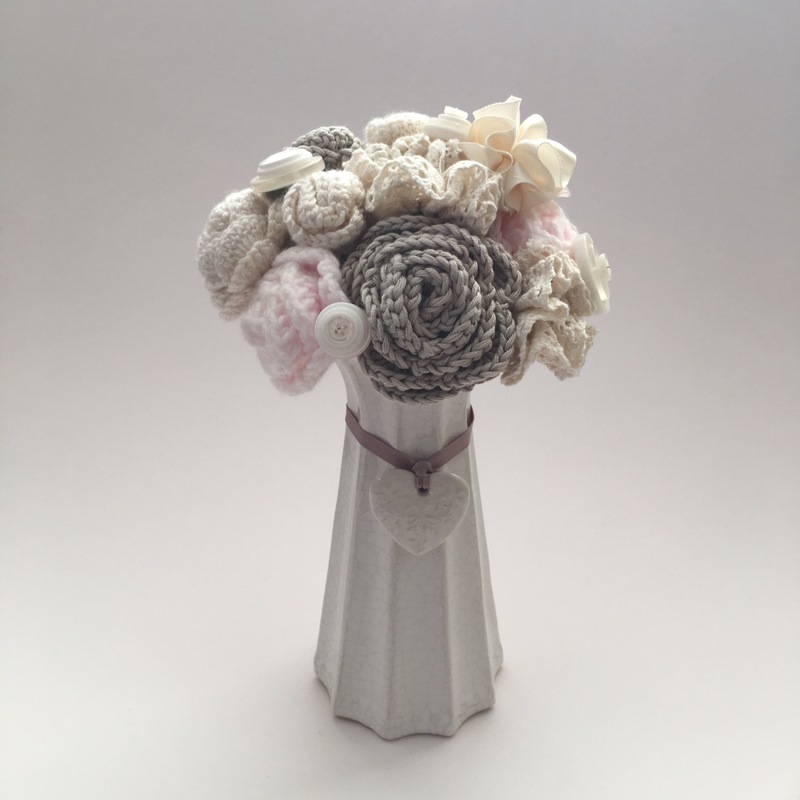 I have whiled away many a happy hour researching forever flowers on Pinterest and Ravelry and I do think that I might have to try them all. Flowers made from the pages of a favourite book (in my case, it would have to be Jane Eyre), felt flowers, button flowers, crochet, knitted and sewn flowers. You name a media, and I’m pretty sure it could be re-purposed into a bouquet. We’ve also been enjoying growing our own miniature daffodils this week – one moment they were just buds and the next they had bloomed. 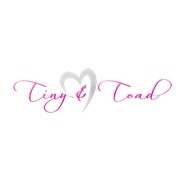 I think I am more excited than Tiny and Toad…and I would really like to fill my window ledge with them. We had a happy little floral accident too. A couple of weeks ago, Toad picked up two hydrangea heads that were lying on the road outside our house. We pushed them all around town in the bottom of the buggy and, later, he insisted on storing them in a drawer in the kitchen. Whilst looking for something at the weekend I stumbled across them and, look, they have dried but retained their beautiful soft blue colour – I really thought they would just shrivel up! Toad was quite fascinated by the new papery texture that the blooms had adopted in their time in the drawer…so much so that I had to restrain him from destroying them… and I have made a fortuitous addition to my forever flower collection. I’ve started putting my wreath together and, in doing so, I am discovering that what I had imagined isn’t what is asking to be made. I had planned something utterly over the top but it’ turning into something s little more simple (but not an awful lot!). 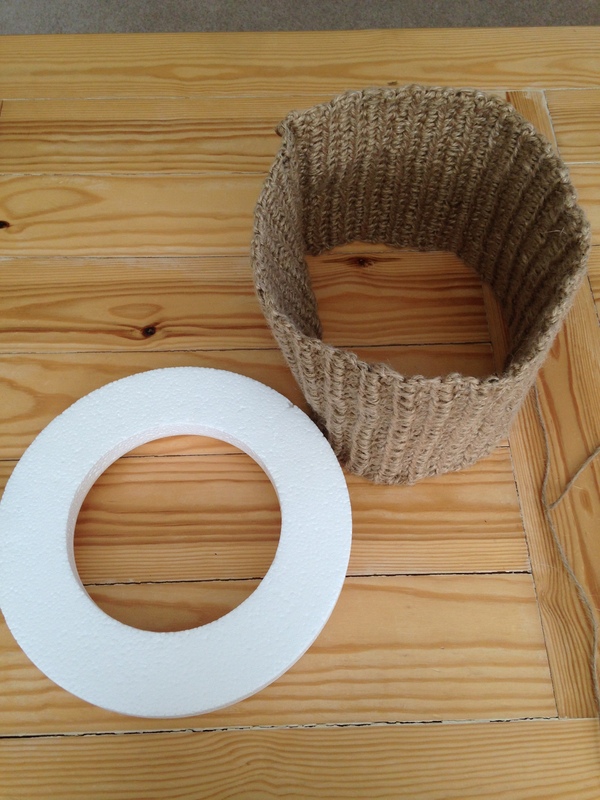 These two little spools are 35 metres long – I wanted to test it out before investing in the larger 100m spools and it won’t be long before I order more. 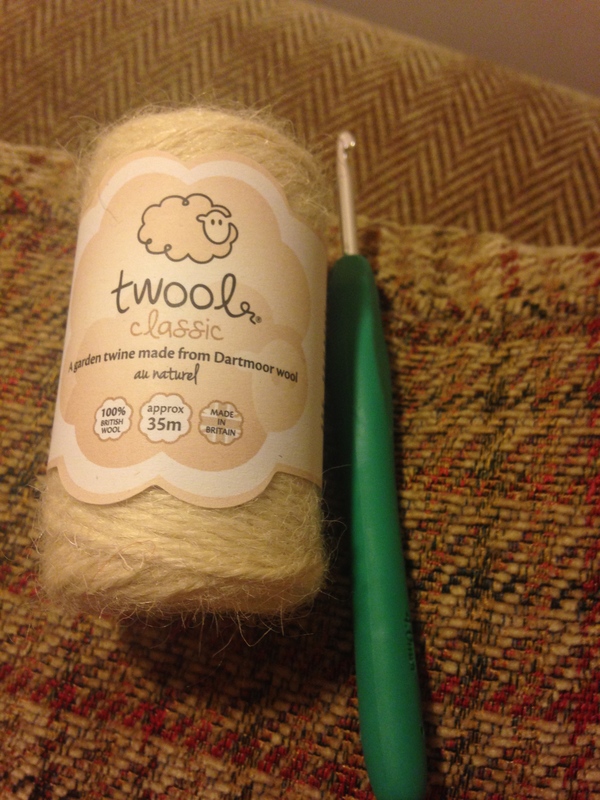 This stuff really is soft and easy to work with and I found a 4mm hook to be just the right size. Look what leapt off my hook! 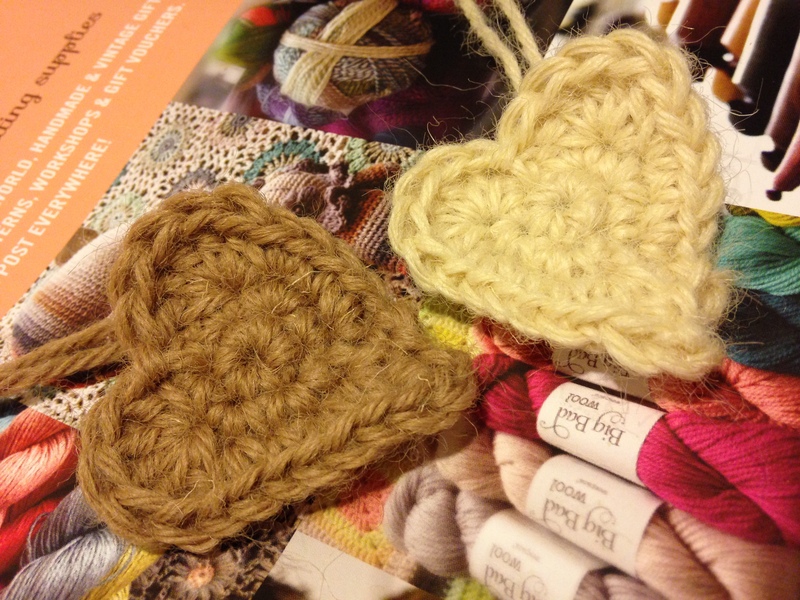 This yarn would be perfect for something outdoorsy – I have in mind something to spruce up my outdoor table when the weather improves, but for now these little beauties have found their way to a spare hook in my hall. 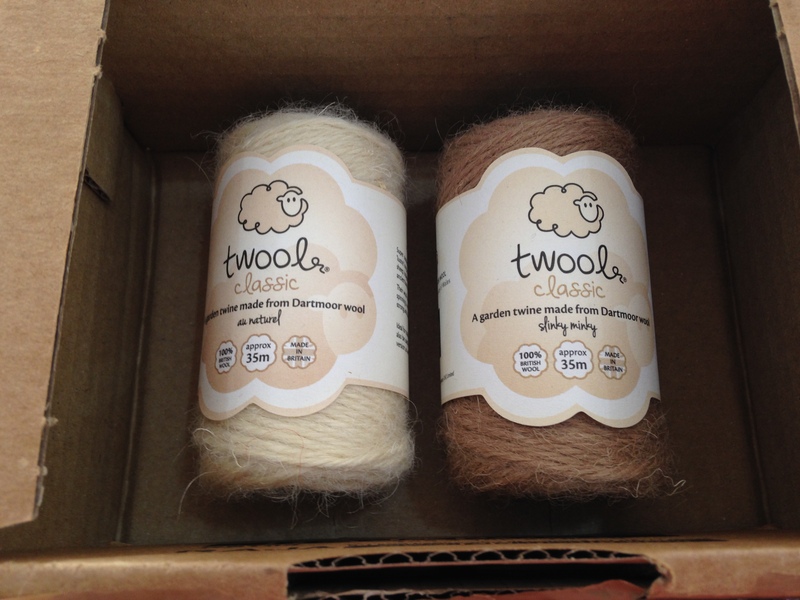 Watch this space for more on Twool. …and finally, remember that second Woo Hoo moment I promised myself? I am really excited by this one – more very soon. Are you still calling it A&E? Don’t be old fashioned, it’s been the ED since 2002. Apparently, it’s been the ED (Emergency Department) for 12 years. I know this, because we spent Friday afternoon on our first trip to the ED with Toad and, a good hour, watching the screen saver (including the above friendly reminder) on the computer in the examination room scrolling, and scrolling … and scrolling. The short story starts with: it had been a short night. After three years in the parenting game, I’ve concluded that a sudden change in sleeping patterns usually accompanies some kind of a developmental phase. Anyway, I digress, this resulted in a tired Toad and an equally spaced out Mummy. It was my Dad’s birthday, so the little guys and I had a trip out to wish him a happy birthday and returned home in time for Tiny to have a nap. Given that Toad was exhausted from a lack of sleep, I had decided that he and I would have a cuddle on the sofa in front of a film while Tiny napped. And, somehow, between that thought and the short trip from the hall to the sofa, he impaled his cheek on the corner of the coffee table. I have two sons, I need to get used to sudden trips to the ED (it’s A & E to me and always will be – I don’t care if I am old fashioned. Not one bit!) as I am sure this will be the first of many. I am not going to get used to it – ever. Our local minor injuries sent us to A&E in Plymouth – maxillofacial docs needed to look at him because of prominent location and the scarring potential and, there, he was finally patched up and the healing process could begin. Toad was an absolute star, he really was. I am, truthfully, still a bit of a mess. Tonight I found him asleep in bed hugging his Certificate of Bravery. It’s moments like that when my heart melts…it melts multiple times a day. 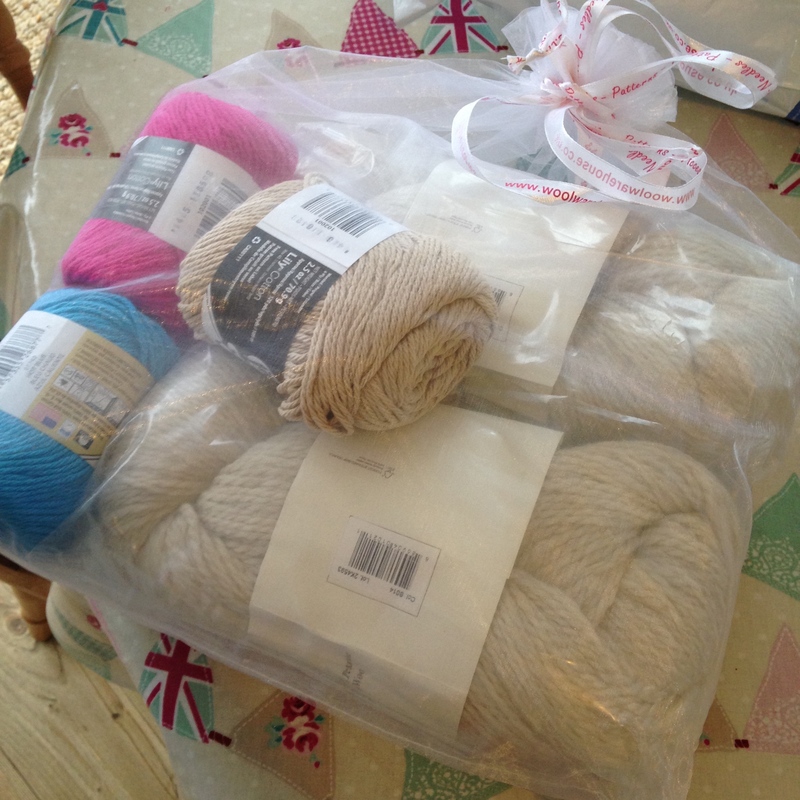 It just so happened that, a few hours before ‘the Fall’, I had finally placed the yarn order that I had been pontificating over since Christmas and, by even greater fortune, the postman rang my doorbell with my deliciously, squishy, exciting parcel early on Saturday morning. Rarely has there been as well timed a yarn delivery as that. The Toad and his Daddy were on a return visit to Plymouth to see a consultant who would decide if he needed a general anaesthetic and stitches (you try holding a three year old still for such a procedure!). The Big Boys left for the hospital before 7am and I stayed behind waiting for Tiny to wake. The plan was for us to follow the Big Boys up to Plymouth such that I could be there if Toad needed the GA.
No sooner had Tiny and I taken delivery of yarn, than Daddy sent me a text saying that Toad had been patched up again, no stitches were needed and they were coming home. I can’t remember the last time that I felt relief like that. I’m still terrified about the scarring and keep re-living the moments immediately after the Fall but, for now, it’s over. 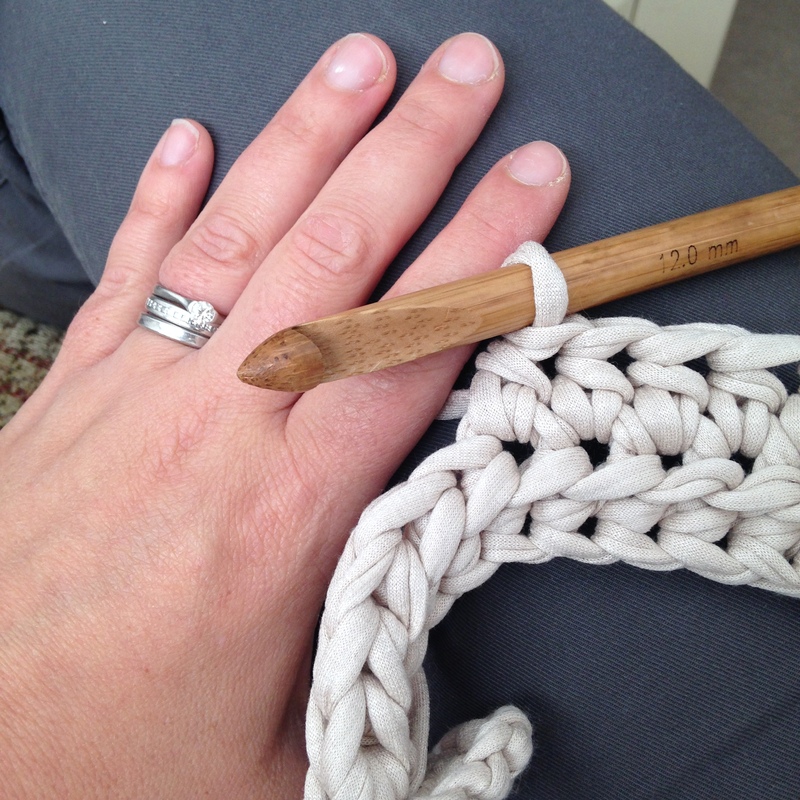 I had had good news and I had a brand new yarn delivery winking at me and begging me to pick up a hook and create. 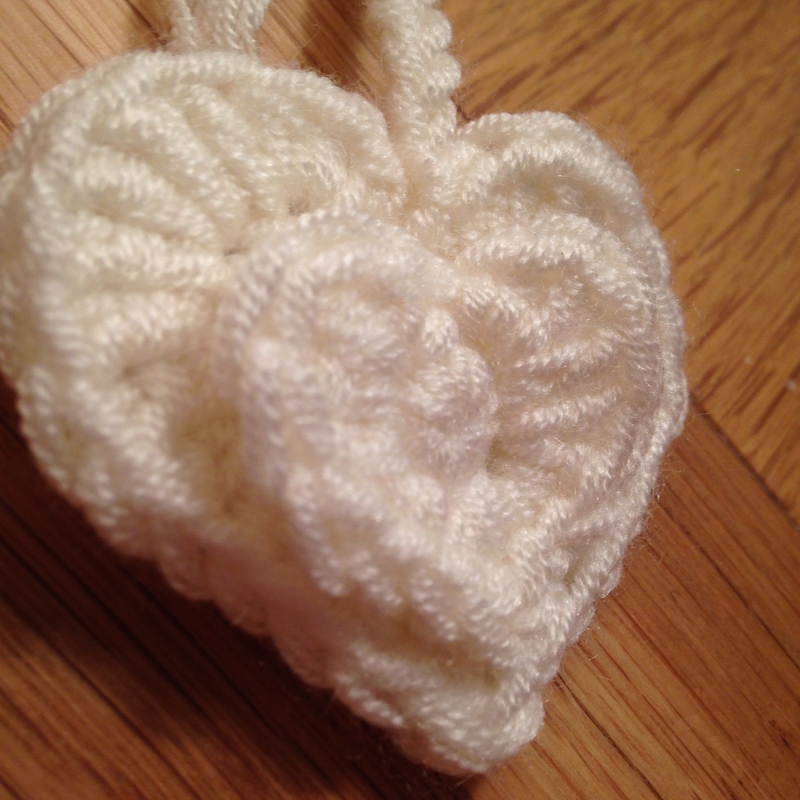 It’s lovely aran weight 100% cotton yarn and I am finding it quick and fun to hook with. As much as I adore a splash of colour, I also delight in creating calm amongst the daily clatter. We have created just that in our lounge (which still needs a lick of fresh paint) and bedroom (which is also semi-finished). 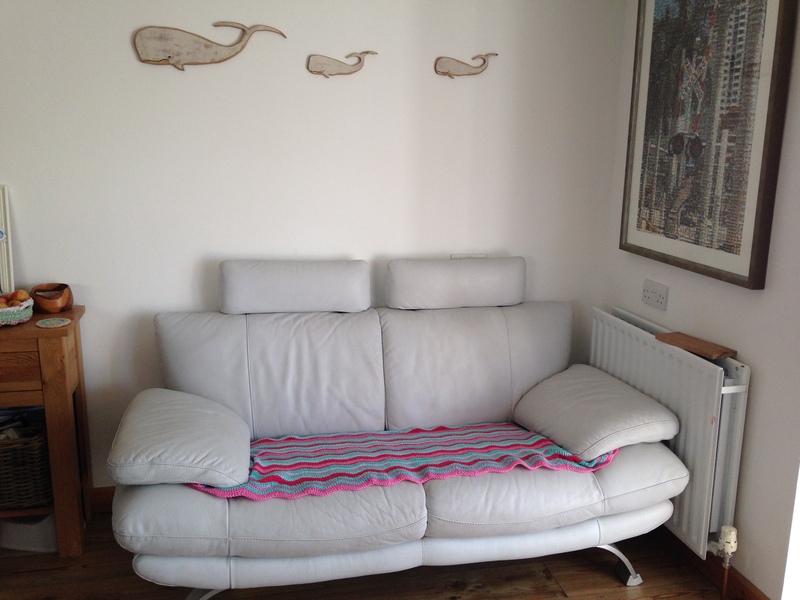 No bright colours in those rooms which makes them wonderfully chilled, child free havens once the Little Guys are in bed and any stray toys are re-homed. More of that later. I have no exact pattern in mind as yet and my throw mojo hasn’t quite warmed up. But it will…once I’ve got the current must make out of my system. And that must make is all about my tea pot. 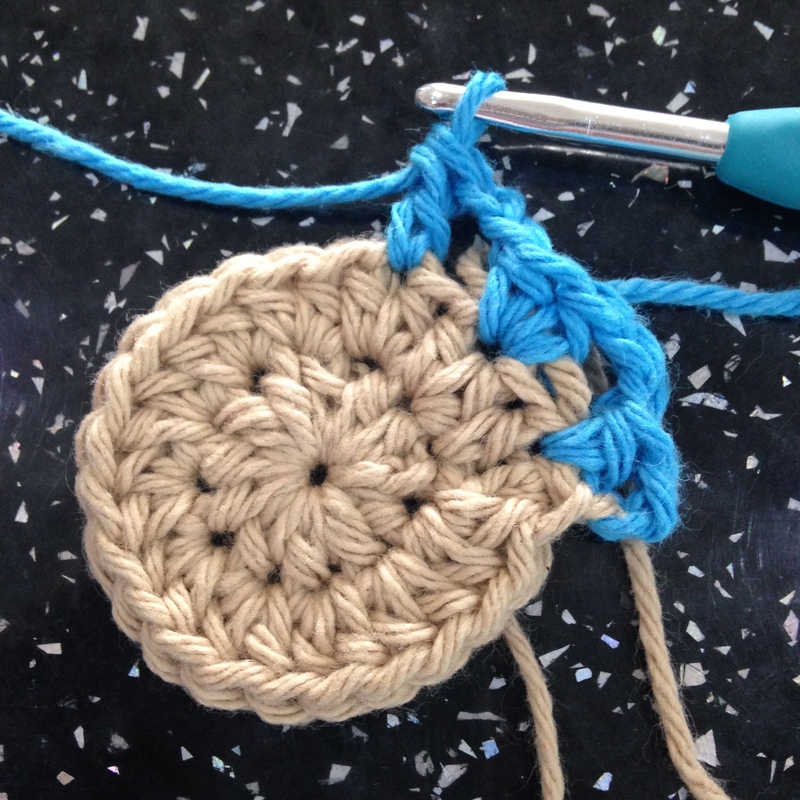 Here’s the start of my teapot stand/coaster. Do they have a proper name? I think I should know that. After the drama of Friday, I just needed to go with the flow. 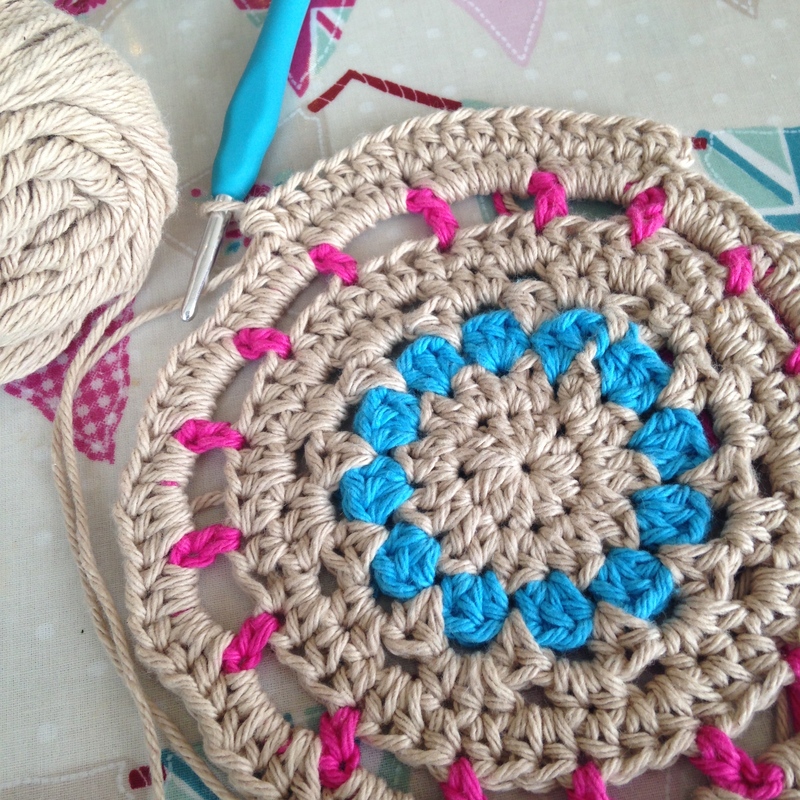 No pattern, no planning, just let the hook show where it wanted to take me and the colour changes happen organically. I’m making it to tone in with the table cloth in the background of these shots and, of course, my tea pot. Somehow, by magic, the spacing worked and I barely had to frog any of it. As I hooked, I relaxed and my shoulders dropped from right up by my ears back down to somewhere near where shoulders should be. 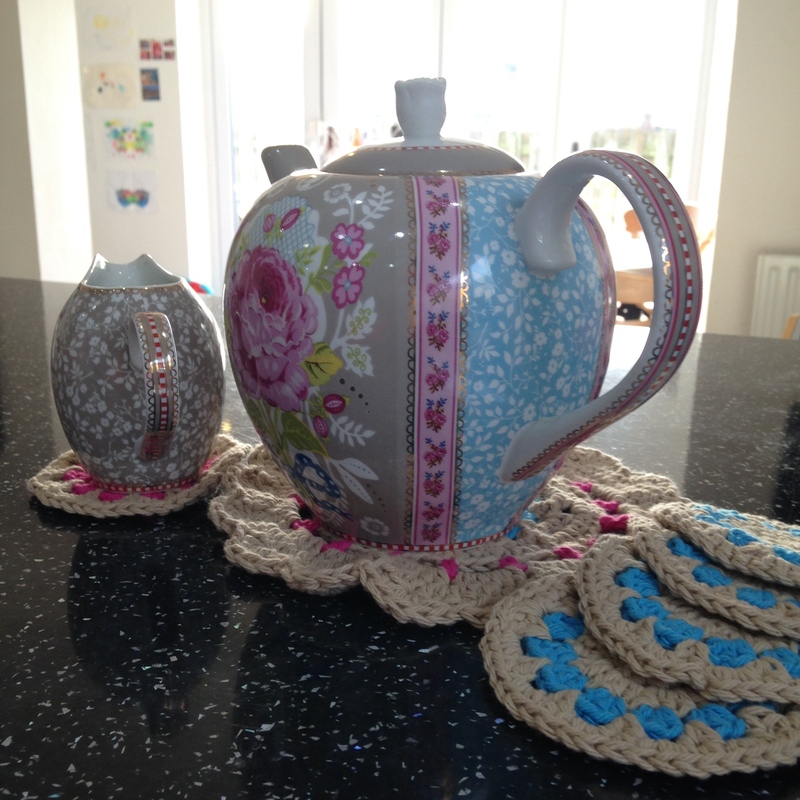 I wanted colour but I didn’t want it to be busy – the teapot does that all by itself. This was a project that I picked up and put down almost as methodically as I hooked. 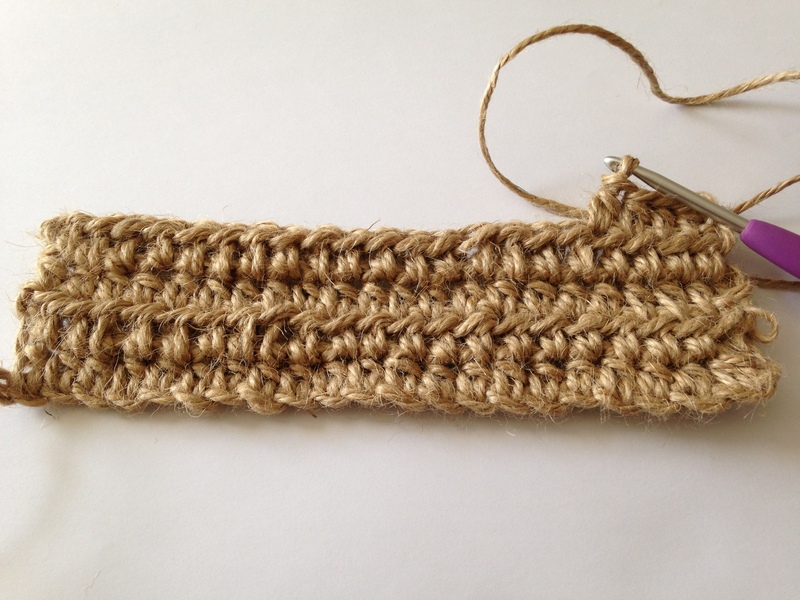 All but the edging are worked in (UK) half-treble crochet so it grew quickly and after only 9 rounds it needed to grow no more. Apologies for the poor quality of what is my first ever whoooo hoooo moment – it was taken at 11pm last night and the light has been so poor today that it wasn’t worth re-taking. But, I couldn’t wait to share. 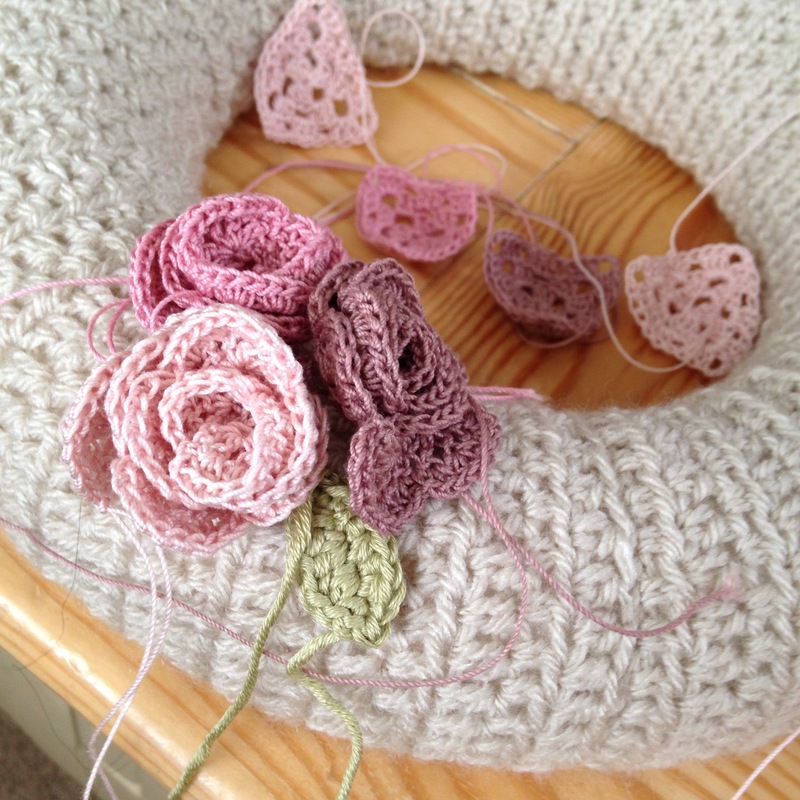 I need to admit that I am not entirely sure that I love the scalloped edging but I wanted a vintage feel and I am not sure I could picot with aran weight yarn to make it look pretty enough. I can’t stop nipping into the kitchen to take a peek – I guess I must be pretty pleased after all. My husband is a great (and willing) sounding board and, as I finished round four, we both remarked that what I had made would make a great coaster. Boys in bed (all three of them!) house to myself and those coasters just flew off my hook. So wonderfully therapeutic. 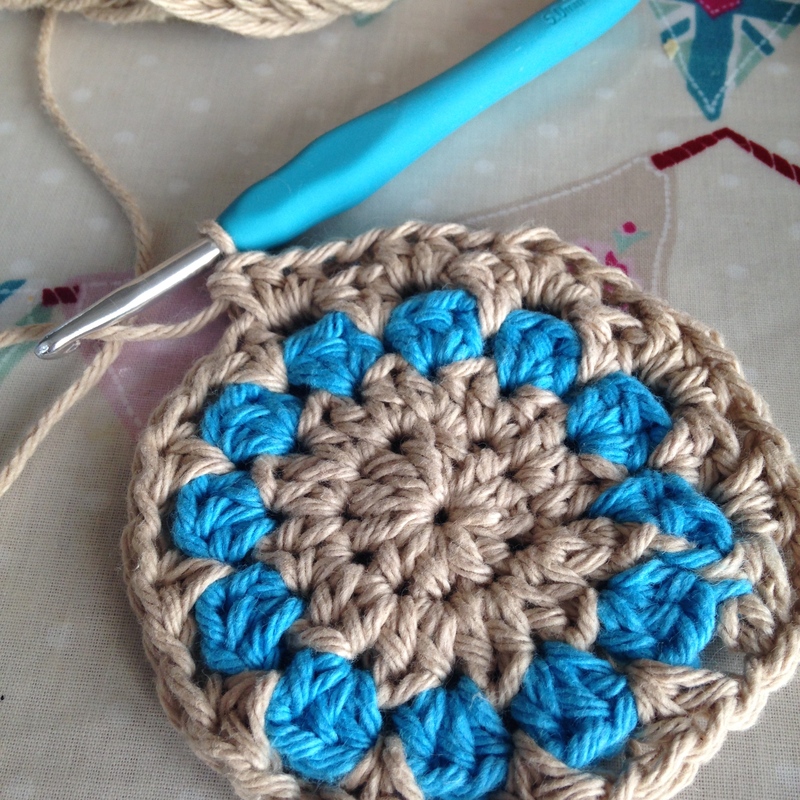 This fabulous craft called crochet, once again, saved my sanity and I’m pretty sure that it won’t be the last time. 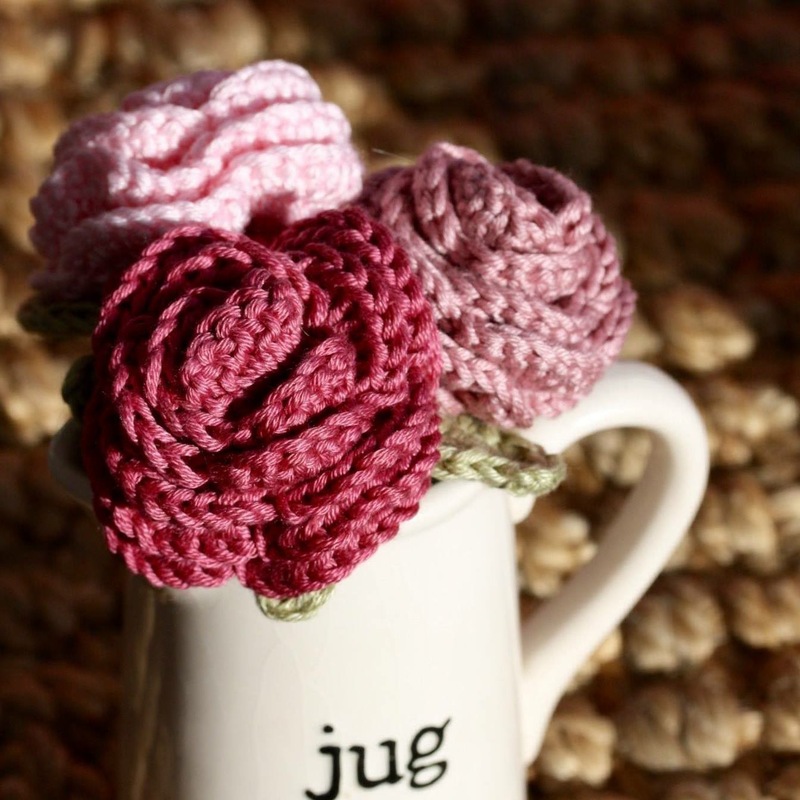 The set is not quite finished – I am going to make another coaster in ‘jute’ and ‘hot pink’ just for my little milk jug and the ends of each coaster need darning in. I think I might just treat myself to another whoooo hoooo moment then. I may even make my first attempt at blocking in honour of that moment too. …and I have a head full of what else I am going to do with more Sugar n Cream. I think me, my hook and the Sugar n Cream are about to stage a kitchen take over. In fact, I know it. …and tiny never did get Friday’s nap.